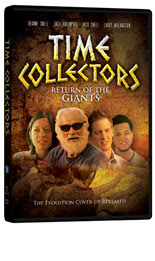 Creation triumphs evolution in the faith-based film Time Collectors: Return of the Giants. After making a fossil discovery that challenges mainstream evolutionary thinking, a wealthy paleontologist named Sam dies suspiciously. Now, Sam's fortune and scientific secret are in the hands of his agnostic grandson, Brad, and there are people who will do anything to bury the truth and destroy Sam's divine discovery. The search for his grandfather's secret leads Brad on a whirlwind journey of loss, self-discovery, and love. As he learns more about Sam's Christian faith, Brad experiences a turning point in his own convictions and a blossoming relationship with Maria, Sam's assistant. Dodging danger, Brad and Maria race to reach the world with their new knowledge before it's too late. I love movies that involve archaeology and digging for proof of God's creation. Time Collectors takes that theme and focuses on the 'giants' of the Bible. Those Biblical characters who were taller like Sampson, Goliath and others, and finding a fossil of one of these giants to prove we didn't evolve from small creatures and slowly over time have grown taller as humans. That God did in fact create us in His image and that there are fossils of Giant men from long ago. Sam's grandson is agnostic, I would have liked to have more background on that and why Sam hadn't seen his grandfather in so many years. Though Sam was a Christian it seemed like he had no relationship with his immediate family which didn't fit in for me. I guess I like the emotional back ground of a show sometimes to show me how they ended up where they did. I enjoyed the show and watching the characters change over time.. something only the Creator of the World can do in people's lives. In an age where family friendly movies are hard to come by, I appreciate all Bridgestone Media is doing to provide us with family friendly, faith entertainment! I received a copy of this dvd in exchange for an honest review.